Wes Warren has a term for his assistant golf professionals. Thanks to the good work of Warren’s assistants, he rarely has to put on his fire hat. Warren, as do other head professionals, lean heavily on their assistant professionals. They are invaluable to the success of the overall operation. They perform a myriad of duties, ranging from being involved in merchandising sales and decisions in the pro shop; giving lessons; and overseeing special programs; and much more. And perhaps their most important duty is being an extension of the head professional, who can only be in so many places at one time. “They basically do everything I do,” said Andy Shuman, the head professional at Twin Orchard Country Club. Warren said he tries to set the tone for how he wants his assistants to treat the members. Nick Cuca, who is in his fifth season as an assistant Exmoor Country Club, says his job is clear. “My primary role is to support the head golf professional,” Cuca said. 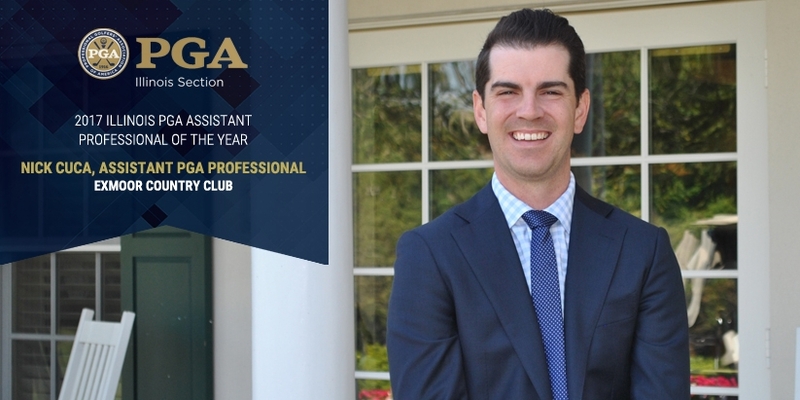 Cuca was recognized for his work by being named the 2017 Illinois PGA Assistant Professional of the Year. He is involved in all aspects of the operation in aiding head professional Dave Schmaltz. Emily Brown, who is in her third year as an assistant at Indian Hill, also finds herself “doing a little bit of everything.” She says a main focus is to try to develop more golfers through women’s clinics and other programs. The task is a bit different for an assistant professional at a public facility, according to Dan Walker. He is in his eighth year as an assistant at Sportsman’s. The big difference is in the volume of golfers, he says. With 27 holes at Sportsman’s, the facility will average more than 50,000 rounds per year. As the group event coordinator, he oversees 20 golf leagues which feature more than 600 players. As for the head professionals, they try to serve as teachers, and more importantly, mentors to their assistants. The process begins from Day 1, Shuman said. He recently welcomed a new assistant to Twin Orchard. The training will include having that newcomer sit in with him on meetings with manufacturers and go out to the range when he gives lessons. Indeed, the assistants want to be in charge of their own facility. Cuca’s passion is teaching, and his ultimate goal is to be a director of instruction somewhere. “That’s what I am groomed for,” he said. Walker would like to remain on the public side, working as a head professional or general manager. He said he is content to stay at Sportsman’s until the “right fit” presents itself. “Not as many of those jobs become available, and they are very competitive when they do,” he said. The same holds true for private clubs, Brown said. Chosen to represent District 6 in the 2018-2019 PGA Lead Class, which identifies emerging leaders of the association, Brown believes she is building her credentials.